Zinedine Zidane is the right man for Manchester United and should replace Jose Mourinho, says Stan Collymore. The Portuguese manager is under some pressure after his second season at Old Trafford, which ended without a trophy. The gap in quality with Manchester City at the top of the table will unsettle Mourinho, and to top it off, reputed sports journalist Stan Collymore has now urged the United hierarchy to take steps in the right direction. The former Liverpool and Aston Villa man feels that Zinedine Zidane is the right man to lead the Red Devils. In a thread of tweets from earlier this week, Collymore claimed that Zidane is the perfect fit for United, and also hoped that his appointment will allow the Mancunians to land long-term transfer targets Cristiano Ronaldo and Gareth Bale. “Zidane would fit Manchester United hand in glove,” he tweeted. “Would take Ronaldo home. Bale possibly,” he added. 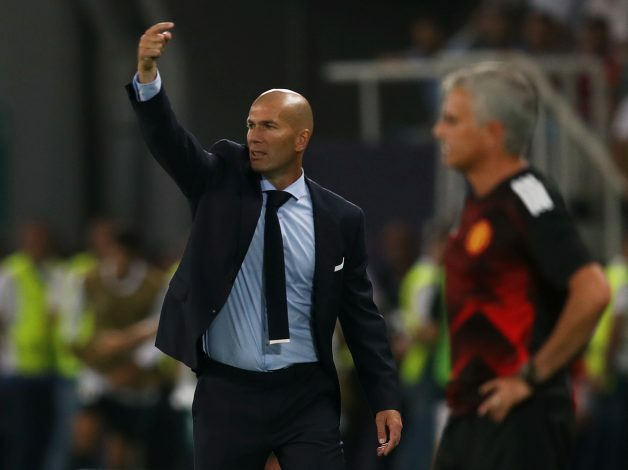 Zidane, who won three UCL trophies on the trot with Los Blancos in less than three years, recently walked away from the post at the Bernabeu, and Collymore believes that a chance to manage United might be enough to lure him to England. He also went on to claim that Zidane is one of the very few managers that can attract players over Spanish mastermind Pep Guardiola, who is currently working wonders at the Etihad. “United could afford anyone in the world, plus Zidane is the only manager players would go to over Guardiola arguably,” he added. Collymore also had some harsh words to say about Mourinho, claiming that United should let Jose leave now, pay him the compensation, and do whatever it takes to land Zidane this summer. “If United aren’t on the phone now, they are daft. United could pay off Jose from behind the sofa,” his tweets further read. The pundit also spoke about Zidane’s ability to win trophies, and the fact that United are in a better position than Chelsea, who also need a manager this summer, to land the French tactician.